Someone's put some thought into the GT780 DX. For starters, this isn't a badge engineering job using a commodity-spec whitebook as a starting point: MSI has commissioned a unique design. The result isn't going to have Apple rethinking its approach to laptop chassis quality but there is at least a frisson of flair in the multi-coloured (and user configurable) keyboard backlighting, slices of genuine brushed aluminium and bevelled chassis edges. That keyboard is the result of an alliance with peripherals specialist SteelSeries and is probably the most tactile and satisfying we have used on any recent gaming laptop. Unlike the slightly rattle-prone and spongey boards offered by, for instance, Rock Xtreme 768 and Medion Erazer X6811, this one is solid of base and slick in action. Speaking of partnerships, MSI has also teamed up with Dynaudio to sort out the sound. The idea is to project it carefully to the user, creating more depth and immersion. Put simply, it works. Although the sheer volume on offer is fairly modest, there's a richness and expansiveness to the soundstage not many other laptops can match. Another nice touch is the trackpad disable button. If you're serious about serving up some online devastation, you'll be using an external mouse. The last thing you want is accidental trackpad inputs. With the trackpad turned off, that's not going to happen. If the bits MSI is responsible for are best on test, what about the off-the-shelf components? As TN LCD panels for laptops go, the 17.3-inch display is decent enough. Thanks to an LED backlight, whites are clean and bright. As TN screens go, the colours and viewing angles are far from shabby, too. Likewise, we've no beef with its responsiveness or the 1,920 x 1,080 native resolution. The only problem is the existence of the Sony F Series and its drop-dead gorgeous screen. What's been seen cannot be unseen and unfortunately the GT780DX's LCD looks positively pedestrian by comparison. Still, we've no such complaints about the gaming performance on offer. The quad-core Intel Core i7 2630QM and Nvidia GeForce GTX 570M are choice components. 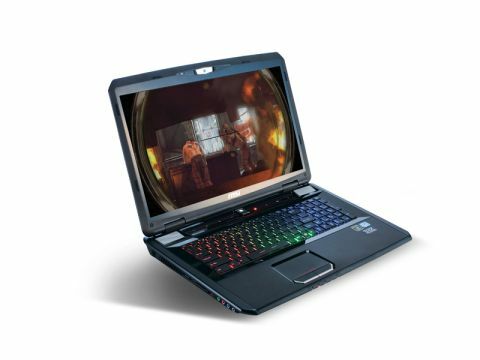 Okay, we'd rather have a GTX 580M or AMD Radeon HD 6990M pumping the pixels. But with 336 shaders, 3GHz memory and a 192-bit bus, the GT780DX has genuine gaming chops. It certainly makes absolute mincemeat of Dirt 3, even at 1080p and with 4x anti-aliasing. An average of 38 frames per second at the same settings in World in Conflict is very decent, too. Only the GPU-wilting Heaven benchmark really gets the better of it. As an overall package, this MSI has got to be the best balanced and most desirable notebook here. It's not the fastest, it hasn't got the best screen, but as a full package it's very hard to fault.